For those dogs that are sensitive to a variety of stimulants, this shampoo will clean and condition the dogs coat and promote healthy skin and fur while minimizing the risk of allergic reactions. 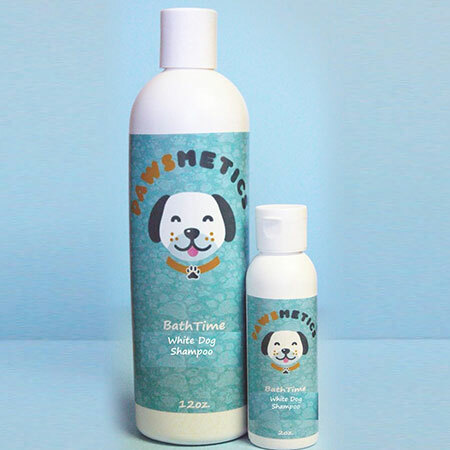 All the Pawsmetics® Shampoos will lather and rinse out easily. Use our Bath Time Hypoallergenic Shampoo to clean, soothe and control allergic reactions. It is the perfect way to keep your dog clean, happy and smelling absolutely fabulous. Containing organic ingredients like Vitamin E, chamomile and and sunflower extracts, bath time has never felt so good or delivered a pet so clean. Choose one of the three size options available below and try it on your pet today. You’ll agree with us that there isn’t a better pet shampoo available for your tail-wagging friend!